Strong power & torque: The NC750X’s liquid-cooled, inline-twin engine incorporates numerous advanced and patented technologies. To ensure strong acceleration, ease-of-use in the city and a relaxed character on the highway, the engine delivers exceptionally strong low-rpm performance. The engine’s unique design creates a muscular, easy-to-use powerband not unlike that of a big-bore cruiser. Distinctive sound and feel: To give the engine a satisfying and distinctive sound and feel, engineers thought way outside the box. An extra balancer shaft was added to inject the engine with just the right amount of “good” vibration. The effect of the twin balancers is to counteract vibration from higher rpm inertia, making the engine feel more refined, yet still with the distinct “throb” delivered by its 270-degree firing order. The intake-port layout inside the cylinder head was carefully designed to create an intentional interference between adjacent ports, which results in subtle combustion variations. In addition, the timing for the opening and closing of the intake valves was set differently for each cylinder. The result of all this? An engine that always lets you know what it’s doing and has a pleasant sound and feel. Strong performance – less shifting: The six-speed manual transmission complements the powerband by using wide gear ratios – no need to be constantly shifting up and down to maintain strong performance. 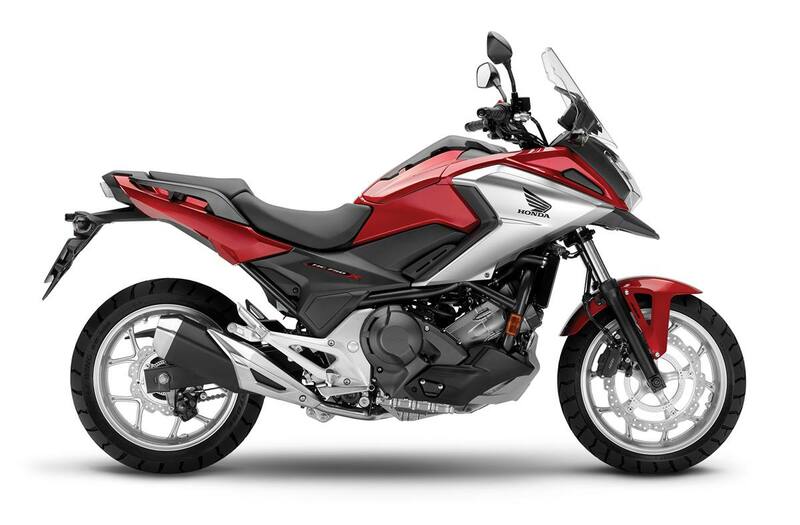 DCT transmission: The NC750X is available with Honda’s sporty DCT transmission, which allows both paddle-operated manual operation and three levels of automatic shifting. DCT even senses whether the bike is travelling uphill or downhill and selects shifting points and engine braking accordingly. Adaptive Clutch Capability Control assists in on/off throttle situations, reducing pitching motions for smoother riding. Free space & terrific handling: The engine’s inline cylinders are canted forward by 62 degrees to help create a low overall centre of gravity for nimble, confidence-inspiring handling, and also to create room for a convenient central storage area where the cylinders and fuel tank would typically be. Exceptional fuel economy: Through the use of friction-reducing technologies, integrated components (such as running the water pump off the camshaft), precise PGM-FI electronic fuel-injection and efficient combustion, the NC750X engine delivers exceptional fuel economy. Smaller can be better: The engine’s efficient use of fuel enables the use of a smaller-volume, more-compact fuel tank that still allows ample riding range while giving engineers extra freedom to re-think the optimal placement of other components. Maximum purification efficiency: The exhaust catalytic converter sits directly beneath the exhaust ports and is activated early when the engine starts. This design lets the combustion gas pass through the catalyst while it is at its hottest, thereby maximizing purification efficiency. Adventurous styling: The NC750X shows off its edgy styling with an aggressive front cowl design, LED taillight, and a tall protective windscreen with venting to reduce pressure and turbulence. The result is a bike that’s is comfortable when cruising at speed, with the windscreen and bodywork diverting wind around the rider to minimize fatigue. Maximized space & better balance: The 14.1-litre fuel tank is accessed beneath the seat at the rear of the bike, with the fuel stored beneath the rider. The tail cowl has been cut short to bring the mass forward, and handy grips have been integrated into the tail section for passenger security. Large-capacity hidden storage: Where the fuel tank would be on most bikes, the NC750X instead has a large-capacity (22 litre), lockable utility compartment that’s big enough to hold an XL-size helmet. Don’t want to carry all your gear when you arrive at your destination? This handy compartment allows you to quickly stash your helmet, gloves and more out of sight. Colourful instruments: The LCD instrument display includes a host of customizable features, including nine choices of background colour. You can even set the background colour to change as engine rpm rises and falls, as you shift gears, or to indicate your selected DCT transmission mode. Wave-style key: Wave-style ignition key is stronger and provides extra security against theft. Comfortable ergonomics: An upright riding position with adjustable tube-type handlebar and spacious seat help to keep you comfortable even on cross-province or cross-country rides. Adjustable windscreen: The VFR1200X’s protective windscreen easily adjusts over a range of 76 mm (3 inches) using just one hand. Extra protection: Standard hand guards provide added protection against wayward stones or inclement weather. Handy power outlet: Need to charge your phone, or run a GPS or another electrical accessory? The VFR1200X’s handy accessory outlet makes it easy. Quality accessories: A wide selection of Honda accessories lets you personalize your VFR1200X exactly how you want it.